A modified Royal Enfield Continental GT 650 has apparently set a new speed record at the Bonneville Salt Flats. The soon-to-be-launched Royal Enfield Continental GT 650 has clocked a top speed of more than 150 mph (241.40 kmph) at the Bonneville Salt Flats in the US. And getting in a total of 20 runs at the salt flats, the Continental GT 650 hit an average speed of 150 mph, and an ecstatic Siddhartha Lal has confirmed the speed on social media, although the record is still pending a formal FIM certification. What is also noteworthy is that the modified Continental GT 650 was piloted by 18-year-old Cayla Rivas, who is a 12-time world record holder. 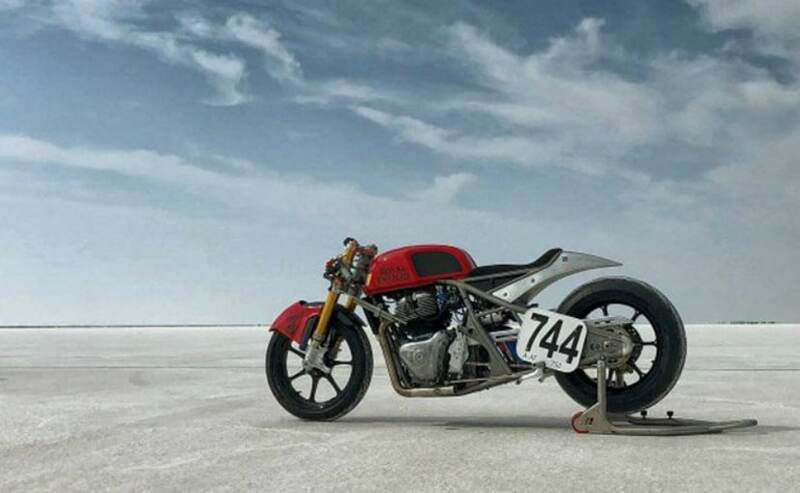 The bike used for the speed runs at Bonneville has been modified by Harris Performance, a unit of Eicher Motors Ltd owned S&S Cycle Inc and the 650 raced into the record books on the first day of the attempt. Not many details are available on the modifications done to the bike, but we can see Ohlins suspension and a completely different chassis and swingarm on the bike used for the speed run. Also visible is a bottle of nitrous oxide (NOS) which is used to provide that extra rush of power to get to speed. The Continental GT 650's run at Bonneville will indeed be quite an achievement for Royal Enfield, just ahead of the commercial launch of the company's most powerful motorcycles - the Interceptor 650 and the Continental GT 650. Both bikes are made in India, with inputs from Royal Enfield's UK Tech Centre, and these will be the first Royal Enfield bikes with twin-cylinder engines in more than half a century. Once launched, the Interceptor 650 and Continental GT 650 will be the most powerful Royal Enfield bikes available on sale. The 650 Twins, as they are called, were first unveiled at the EICMA show in Milan last year, and will be commercially launched soon, both in India and for the rest of the world. The new engine is a 649 cc, parallel-twin engine which puts out 47 bhp of maximum power at 7,100 rpm and peak torque of 52 Nm at 5,200 rpm. In stock form, the new engine is said to easily touch speeds of over 140 kmph, and Royal Enfield will be targeting a completely new market segment with an offering that is expected to have a significant price advantage. The Royal Enfield Interceptor 650 and Continental GT 650 are expected to be priced at between ₹ 3.5-3.75 lakh in India, and at that price point, the contest will be purely with Triumph's modern classic range, with a massive price advantage.